Simply Lora's Beauty: Lora's Beauty All-Natural Men's Line! Lora's Beauty All-Natural Men's Line! Finally, after product testing for months, sniffing multiple fragrances, and endless hours of work on the website, LB Equipment is finally open for business! 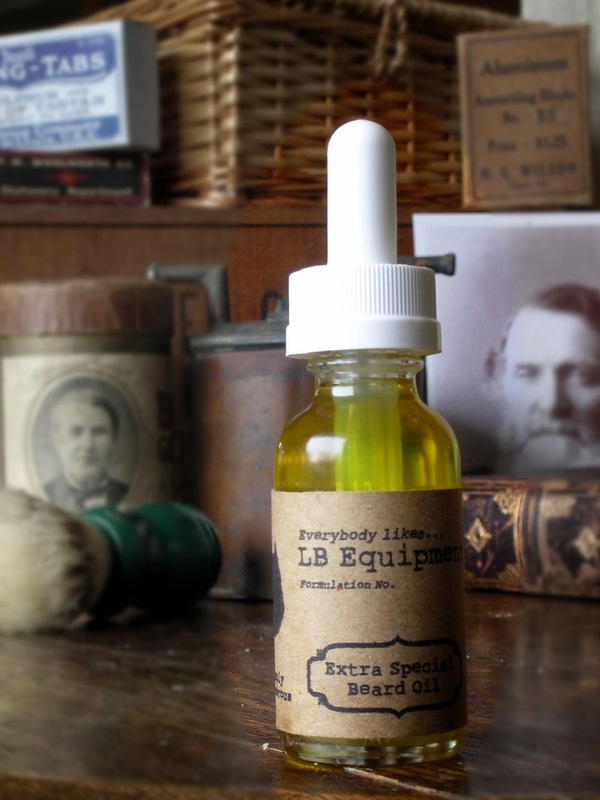 LB Equipment will feature a men's line of all-natural skin and hair care items with the star of the show being the new Beard Oil! Put simply, beard oils are a critical part of maintaining healthy whiskers. This is especially the case in cold and dry climates where mistreated beards soon become brittle, broken, rough and out of shape. The fundamental truth of this has been lost in decades of shoddy chic and creeping causal styles. Number 3 is LB 's classic original recipe. This beard treatment is made with a special blend of oils including fine Sweet Almond Oil. The Tony is a great place to start if you are looking for something effective and simple to use. Number 7 is LB's superior recipe made with Jojoba Oil, for course hair and the heavier of beards. It offers more rapid absorption for superior conditioning. up the foaming lather oils and added a touch of oxide charcoal to pack this bar with skin soothing properties that make for a great shave. Using a shave soap and a brush may be retro, but it's the best way yet to obtain a close, fine, and nick-free shave! Last but by no means least, LB Equipment has the most aesthetically pleasing mug of beer...soap yet! The Manly Mug of Beer Soap/Shampoo is the perfect bar for cleaning your beard, hair, and body! This generous 7 oz bar shampoo is specifically formulated, when used daily, to yield a superior beard and better conditioned hair. Best part of all, it smells as good as it looks! The spicy, musky smell is sure to be a crowd pleaser! LB Equipment, like Lora's Beauty, will have free shipping on all orders $20 or more in the US. Orders from both stores can be combined and shipped together.